Area : 29.2 sq. km. Temperature : 34° C in Summer. 11° C in Winter. Elagiri Hill is one of the hill stations in Tamil Nadu. Situated amidst four mountains in a serene atmosphere, it is well for its salubrious climate prevailing over there throughout the year. 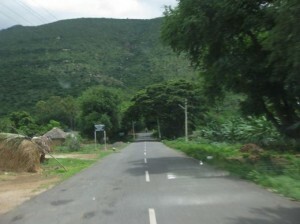 Elagiri hilltop can be reached by a winding ghat road, which has 14 hairpin bends. The hairpin bends offer panoramic, breath taking views. The seventh hairpin bend is significant, since it offers the view of the slopes of the mountain and the green forest covering as a carpet of the hill. Air: Nearest airport at Chennai (220 km) and Bangalore (160 km). Rail: Jalarpet railway junction (19 km). Road: Buses are available from Jalarpet railway junction on Chennai–Bangalore / Coimbatore Sector, Tiruppathur, Vaniyambadi and Vellore. 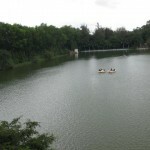 Punganur Lake: It is an artificial lake excavated in an area of 56,706 sq. meters. Boating on the waters of this lake can be an enchanting experience. An artificial fountain has been installed at the center of the lake, which sprinkle water up to 15 ft. height. The fountain is illuminated at nights with colorful lighting arrangements. Children’s Park: A well laid out park on a 6-acre land adjacent to the lake is established for the delights of the children visiting Elagiri. Varieties of children’s play materials are installed within the park. Mini Zoo: A small zoo has been established in an impressive manner and environment. Velavan Temple: A temple for Lord Murugan is located atop a hillock. The location of this temple also serves as a viewpoint from where one could have the pleasure of viewing the green woods of the Elagiri Hill. Festivals of this temple are conducted during the Tamil month of Adi (July – August). A gigantic sculpture of Gadothgajan in a freestanding poture is erected in front of this temple. Government Fruit Farm: Botanical Garden at Athanavur and Nilavur have varieties of fruit bearing trees and plants which bear flowers of various hews and shapes. Government Herbal Farm: The forest department maintains a herbal farm adjacent to the Punganur Lake where herbs and shrubs are cultivated to produce the main ingredients in producing Ayurvedic and Siddha medicine. Telescope House: It has been installed on the ghat road for the benefit of the tourist to have glimpses of the slopes and terrains of the hill. Jalagamparai Water Fall: ‘Attaru’ River passes through the Elagiri Hills and falls from 30 mts. height at Jadaiyanur on the other side of the hill. This could either be reached from Tiruppathur (15 km) or by an hour’s trek from the hills. Adjacent to the Jalagamparai falls, there is a Murugan temple located within a building constructed in the shape of Lingam. Vainu Pappu Solar Observatory Kavalur: The biggest solar observatory is situated in Kavalur, which are 35 km from Tiruppathu and 25 km from Elagiri. It could also be accessed from Vaniyambadi (30 km). All are welcome on Saturdays from 4 p.m. to 6 p.m. without permission. A large variety of Deer roam around the observatory. There are avenues for organizing adventure tourism activities like trekking, mountaineering, rock climbing and hang-gliding in the hills and the slopes. Forest department of Tiruppathur may be approached for assistance and guides to trek through Elagiri hill. This entry was posted in Elagiri Hill, Hill, Tamil Nadu and tagged Hill. Bookmark the permalink.